I would like to tell you the story of a sculpture. 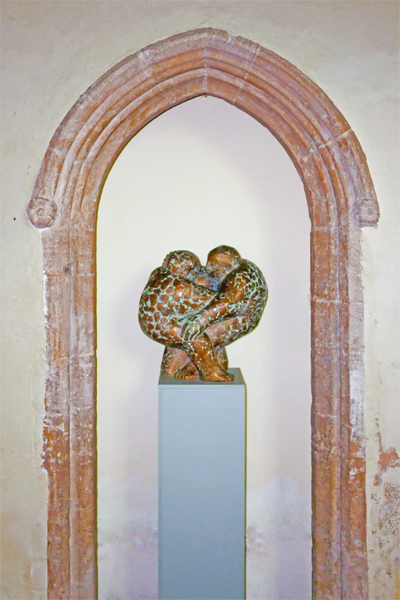 The sculpture which I call: "I will not let you go ". I had been asked to design a piece for the chapel of a large psychiatric hospital in the east of Holland. The hospital wanted to create a place for meditation including a sculpture , which would be conducive to contemplation. The patients live there year in year out, not able to participate in society as we know it. Wondering what I could make that would be pertinent to these people's experience, the Biblical story of Jacob wrestling with the angel came to mind because of the struggle involved (Genesis 32.22 - end). We all grapple with life and these people perhaps more so. We struggle with the difficult and sometimes inexplicable things life brings. We struggle with our image of God; who is He, where is He, is He at all? We struggle with our own inner beings, our dark sides, who am I? In this story I saw all these aspects. This mythical story (mythical in the sense of deep truths illuminated in story) consists of a few enigmatic sentences. Who was this man who wrestled with Jacob and why did they fight? What led Jacob later to say "I have seen God face to face and my life is spared"? When looking through my art history books to see what had been done with this story in the past I found nothing which said much to me. Usually one man wrestling with another man with wings. Rembrandt portrayed an angel looking a bit sarcastically at the struggling Jacob. But the angel had his arm tenderly around Jacob's shoulder. This touched me. Still, the angel was remote. My first sketches in clay were of an angel big and strong, compassionate and protecting. Jacob was weak, helpless, grasping the angel for dear life. Was this accurate? The man (angel) could not break away from Jacob even after having dislocated Jacob's hip. Jacob was tenacious, not weak. The struggle continued through the night till daybreak. The man saw that he could not throw Jacob and said "Let me go for day is breaking". The angel was not strong and superior. There was vulnerability. The vulnerable man became the crucified one in my mind. The submitted God. This started off a whole new series of clay sketches. The wings of the angel became the beams of the cross with a still clinging Jacob. I made many superior, loving angels. Then I made many crucified weak angels. There was something to both facets, but I was not satisfied. There remained a here and a there. He there, we here. A distance. Jacob: "I will not let you go unless you bless me." Angel: "What is your name?" Jacob was asked to come face to face with what he had become. "Jacob" means "supplanter", "betrayer". The fiery monster in the film Fisher King took on a new significance for me. This horrible apparition for Ferry was his hound of heaven. His meeting with truth which would in the end set him free. Ferry had slipped into psychosis to escape a reality which he could not face. Somehow, in Jacob's admission lay his release, his blessing. "Your name shall no longer be Jacob, but Israel, because you strove with God and with men, and prevailed." "Israel" means "God strove" (!) or "contender with God". One day in my studio, knowing I had not yet reached a core, out of frustration I balled up my most recent sketch and made two wrestling figures. Big, strong figures, almost Sumo wrestlers. Both entering the struggle with each other, Both involved in the same fight, nose to nose. No wings, no cross, no distance. Both bound in the earthly business. My intuitive heart was delighted. It was the interaction which I had been missing. The interaction between ourselves and our inner beings, God and life itself. We are not only passive players. My wrestlers are interdependent. If either lets go both will fall. Is it a fight or a holding on to each other? It is a meeting, face to face, nose to nose. 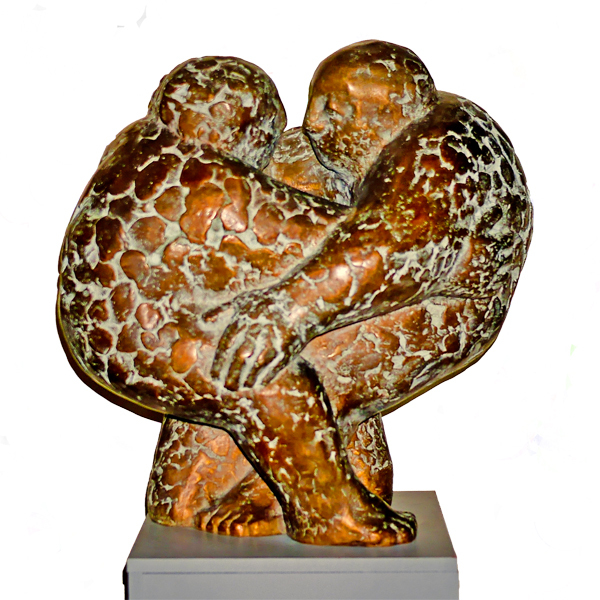 When I brought the piece to the hospital there was a patient who spent some time with the sculpture. She introduced herself to me and told me what it meant to her. She said this is no fight, this is love. This is friendship. This is listening and speaking and being heard. I thanked her for her words and was very grateful, as I usually do not have much feedback on pieces for public buildings. Later 1 learned from the staff that they were amazed at our little dialogue because normally this woman was incoherent. She was not able to communicate meaningfully yet to me she spoke very succinctly. Something about the sculpture had enabled her to speak because it had spoken to her. Art, be it visual, auditory or physical, speaks on a non-rational, non-verbal level and reaches into those places beyond words to feed, to recognise, to give us back something essential of our humanity. 'That night Jacob got up and took his two wives, his two maidservants and his eleven sons and crossed the ford of the Jabbok. After he had sent them across the stream, he sent over all his possessions. So Jacob was left alone, and a man wrestled with him till daybreak. When the man saw that he could not overpower him, he touched the socket of 'Jacob's hip so that his hip was wrenched as he wrestled with the man. Then the man said, "Your name will no longer be Jacob, but Israel, because you have struggled with God and with men and have overcome. Jacob said, "Please tell me your name ". But he replied, "Why do you ask my name?" Then he blessed him there.